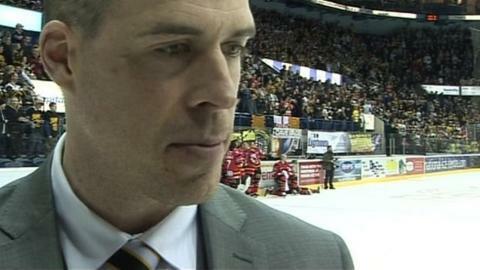 Nottingham Panthers booked their place in the Elite League play-off final with a convincing win over Fife Flyers. Two quickfire second-period goals saw Panthers take control, David Clarke finding the top corner and Logan MacMillan netting on the break. Ryan Dingle's speculative shot gave Fife hope early in the third period. But Brad Moran restored a two-goal lead and Evan Mosey's backhander ensured Panthers will face Coventry in Sunday's final at the National Ice centre. Coventry, who beat Cardiff Devils 6-2 in the first semi-final, await Nottingham in Sunday's final. The game will get under way at 1600 BST. You can hear live commentary of the match on the BBC website.